Dudhwa National Park, located in Uttar Pradesh, became the first park in India to see the relocation of several Greater One-Horned Rhinoceros (Rhinoceros unicornis Linnaeus 1758) in 1984. Nine rhinos were brought in from Assam and Nepal and released in an electrified fence over two years. While the forest department managed and monitored the population over the years, and the population saw a rise in number, there was increasingly a need for a more systematic and scientific method. Along with the Dudhwa Tiger Reserve staff, WWF-India initiated a robust monitoring technique with the help of the National Trust for Nature Conservation (NTNC), Nepal. Identifying each of the rhinos by their morphological features and compiling that data was the first step in the program, followed by the monitoring of each individual - its prefered habitat, dietary selection, behaviour and social groups. 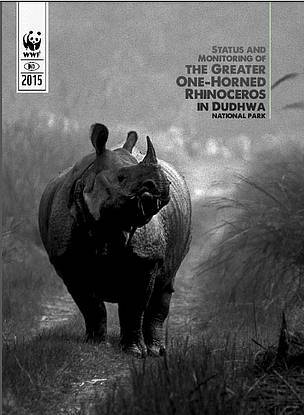 Marking the thirty years of the first relocation, WWF-India has released a new monitoring field guide, compiling the individual rhinos by the way of photographs and morphological characteristics. It also includes sighting data sheets for each rhino and family histories of each of the rhinos. A Hindi version of the field guide will be handed to the field staff so that they can read the details provided. The report was prepared by the Terai Arc Landscape team at Uttar Pradesh/ by Project Officer Ruchir Sharma, with administrative help from Dr. Mudit Gupta, Coordinator TAL-UP.